It is impossible to live in Central Nebraska in late spring without thinking of green pastures. Either we are blessed with an abundance of rain that brings strong and healthy grass to our native plains, or else we pray for the moisture that we need to turn our brown pastures into a verdant green. In either instance, the thought of green pastures dominates a rancher’s mind. Nebraska is home to 24 million acres of rangeland and pastures (more than 1/2 of the state) where cattle turn grass into a human edible protein source (beef) and other needed products. Cattle are the great “up-cyclers” as they up-cycle grass into human nourishment. Leading cattle to greener pastures is relatively easy, especially after a little bit of classical conditioning where they learn that when we move them that they get to go to a place with better food! The New Testament is filled with instances where Jesus is described as the good shepherd, but we also find references to our Father God as a shepherd in the Old Testament. The above verse in Psalms reminds me of two very important components of faith. There is a necessary leap of faith for us to fully abide in God — we must actively accept Jesus’ gift and love in our hearts as well as embracing the guidance of the Holy Spirit in our minds. Questions often outnumber answers but, when we listen with care and intention, God always gives us enough guidance that we can follow his desired life path. It is there that we find the greenest pastures as our hearts fill with peace, strength and purpose. I think that I never really understood the importance of a “good shepherd” until I became an animal caregiver in the late 1990’s. I’d read about it, but the full magnitude of what it meant did not become clear in my mind until I learned to be a cattle caregiver. My animals depend on me for their basic needs — they look to me for leadership — and they submit to my guidance in order to thrive. How do they know that I will lead them to greener pastures? Because I consistently provide for their needs. As humans, we ask a lot more questions than cattle do. We’re a lot smarter and it takes more than physical satisfaction for us to live a meaningful life. It is important for us to ask God questions, but it is equally important for us to trust that he will lead us to an honorable life. We don’t need to have all of the answers — that is why we have faith. We can look to many things to provide meaning in our lives, but there is only one source of living water that fills our hearts with joy and brings honor and purpose to our existence. Faith is a verb. It requires patience as well as perseverance. It comes from a beautiful blend of submission and guidance, and comes wrapped up in a package of love. God is a good shepherd — and we bring honor to Him as we choose to live our lives embracing his purpose. Who will be the Scott Frost of the beef industry? Last weekend, I popped open my facebook account to find a Feedstuffs article that he authored. The title “Frost Returns to Nebraska” caught my attention as any true Nebraskan is aware that the Cornhuskers recently hired Coach Scott Frost to lead our football team back to greatness. A former Husker quarterback, Frost led Nebraska to its last national championship game twenty years ago. I remember it vividly as it was my first football season on the farm in Nebraska. The Big Red Nation has gathered around Coach Frost in support, and the hope of a return to greatness permeates the hearts of the 1,896,190 residents that call the Cornhusker state home. I never understood the united pull of loyalty toward a football team until I moved to Husker country. It seems that all 77,220 square miles of prairie bleeds red on game day as fans from all across the state unite to cheer on their boys of fall. Who will lead the beef industry to united greatness so that we can effectively communicate with our customers and build trust in our product? It is no secret that the beef industry struggles for unity on a vast array of issues with over 900,000 independent farmers and ranchers that care for over 93 million animals. It takes an average of 2 years to bring beef from farm to fork, and many animals have multiple owners across their lifetime. The complex lifecycle of beef results from a unique blend of resources needed to bring the animals from a birth weight of approximately 75# to a final weight in the neighborhood of 1300#. It takes a team of people to care for a calf across his lifetime; and politics divide the beef industry in much the same way that they currently antagonize the unity of our great Nation. A divided nation struggles to tell its story. A divided nation creates internal chaos which drowns out the voices of its customers. A divided nation fails to achieve as high a level of efficiency when striving to work for continuous improvement. The importance of transitioning our farms/ranches across generations so that our children can carry on the tradition of raising food. The list is long and the importance of success cannot be understated. Within each of those above topics lies a long list of subtopics as we strive to responsibly raise a quality beef product. Does any one person exist that can unite us in our search for greatness? I don’t know, but I can tell you that it will take a team of dedicated individuals to deal with the challenge of building trust with our customers. Learning to listen, pool our ideas, and create viable production changes to meet customer asks will determine the success of the industry over the next twenty years. I don’t want to lose my ability to create a memorable family dinner centered around a delicious steak any more than the die-hard Husker Nation plans to let the tradition of victory fall by the wayside. 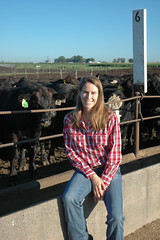 What happens each day at a cattle feedlot? This has been a week of tremendous learning and growing for me. I did my first Facebook Live broadcast and increased my tech savvy by leaps and bounds. For those of you that do not participate in Facebook, I was able to save the Live Broadcast and upload it to YouTube. This enables me to share it here! So, take a few minutes — grab a cup of coffee — and watch my favorite blonde cowgirls and I interact with the Lazy YN Fall Calves. I believe that the Live broadcast was a solid first effort. I have many things still to learn and work on; but I enjoyed the experience. To date, the live video has reached more than 15,500 people — with more than 6300 of them choosing to watch it. 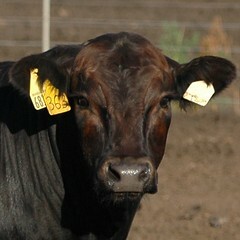 It is a raw, from the heart, unedited look at our cattle at the feed yard. I am very thankful that Megan and Karyn were able to help me out — it created a fun experience for the three of us to cap off the summer vacation. Having gotten my feet wet this week with Live broadcasting, I am going to take the plunge on Monday to do a second broadcast via Innovative Livestock Services. As many of you know, we live within the Path of Totality for the #SolarEclipse2017. The partial eclipse will begin about 11:30am central time, with the short period of total darkness occurring just before 1:00pm. The live broadcast will occur at 12:00pm central time during the partial eclipse. I am going with a “Tail Gate” theme and will be joined by Brandon Sorensen who is the Assistant Manager at Roberts Cattle Company. We are going to hang out with some of our Lazy YN calves and talk about Mother Nature, the eclipse, and how we care for our cattle in the feed yard. I think that 12 months ago if anyone told me that I would be doing live social media video broadcasts from a feed yard, I would have looked at them like they were crazy. But, life is an interesting journey full of twists and turns. While live broadcasts are a little bit scary and the end result (at least for an amateur like me) is not professionally polished, I think that they create a necessary level of transparency between farmers and our urban neighbors. Unedited creates a level of truth and trust that is hard to otherwise obtain. For that reason, I am taking the plunge. 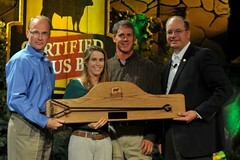 Click here to access the Innovative Livestock Services facebook page. In order to view the facebook live broadcast, you need to “like” or “follow” the page. Then click the “following” button just below the cover photo and make sure that you click “see first” and turn your notifications “on”. It’s hay season and my favorite farmer and his crew are one third of the way through the first cutting of alfalfa. Matt and his guys will harvest 4 cuttings from May to the end of October. Weather permitting, they run 24 hours a day for 7 days a week during the summer months as 3300 acres of alfalfa keeps them plenty busy. We are blessed to have an awesome set of guys to help us out! In honor of my favorite farmer, this week’s video is entitled “Makin’ Hay” and describes the alfalfa portion of our farm 🙂 Enjoy! We took our second set of cattle to pasture last week before heading to the Nebraska State Track Championships. We’ve received plentiful rain this spring so the grass is lush and ready for cattle! I took the opportunity to create a new video and continue to develop my skills. I am looking for ideas to continue to building my video making skills, so if you have topics that you would like to see covered please leave them in the comment section. Thank you! After twenty years in Nebraska, I can report that the world turning green in the springtime provides one of the year’s greatest blessings. A little bit of rain, some sunshine, and warming temperatures brings the countryside to life after a long winter. We celebrated the start of spring yesterday taking our first set of cattle to grass. These yearling steers shipped from a ranch about 25 miles from our farm and will grow on our pastures for the first part of the summer. It is good to have some cattle on the farm again. The beautiful blue skies and 70 degree temperatures provided an awesome day to go to grass. My two blondes are looking forward to helping to care for the cattle while they graze our pastures. After these cattle finish growing on grass, they will ship to Roberts Cattle Company in Lexington, Nebraska. My new job at the Beef Marketing Group allows me to play a role on the feed yard team at Roberts, helping them with their cattle care and responsibilities with the Progressive Beef program. I am looking forward to being able to trace these calves and their care all of the way through the feeding period and on into the packing plant. Look for periodic updates on these yearling steers and the fall calves also born on the Lazy YN Ranch that will be spending quality time on the Feed Yard Foodie farm this spring/summer. I was lucky enough to grow up down the street from my grandparents. Although they have been gone for several years now, when I think of them the word that comes to mind is devoted. More than 70 years of marriage, the sun rose and set for them in each other. As a little girl, I dreamed of finding a soul-mate — someone to build a life with just like my beloved Grannie and Dedaw. When I brought my favorite farmer to Florida for the first time, my Grannie loved him at first sight. I still don’t know if she innately sensed that he was my one, or if she simply loved me enough to believe in my heart. Either way, she showed me with her life that love required work — a good marriage necessitated diligently doing chores — and that the blessing of sharing your life with someone always topped the priority list. When you work well together, chores are not just a necessary part of life — they are part of what makes life fun. Last weekend Matt and I took down my winter horse fence. Intermittent warm days inspire the alfalfa to green up and start to grow, so it is time to corral the horses and take them off their winter pasture. Since it snowed on Saturday, we opted to wait until Sunday to take down the electric wire fence. We traded the Saturday snow for a 35 mile an hour wind on Sunday. In hindsight, I’m not sure that we picked the correct day, but we bundled up and laughed our way through the chore. We brought along our favorite blondes as we’ve always maintained that families that work together find greater love together. Cattle outnumber people in the state of Nebraska by a ratio of just under 4:1. We share our great Cornhusker State with a healthy population of deer who reside amidst the 1800 miles of river ground within our boarders. Slow down as much as possible without losing control of the vehicle. Stay in the middle of the gravel road where the traction is the most consistent. Hold the steering wheel with two hands and drive STRAIGHT. Do NOT SWERVE. Natural human intuition often leads to swerving to avoid the collision. Swerving results in losing tire traction on the uneven gravel and crashing the vehicle into the ditch. It is preferable to take the deer head on which allows you to better remain in control with a solid driving surface. It was pitch black dark the morning that a doe mule deer decided to cross the road in front of my vehicle. The look she gave me reflected her lack of foresight and thought, but I am glad to report that I had enough to cover both of us. I followed my favorite farmer’s advice to a T, and all ended well. As I recounted the experience of saving both myself and the deer to my girls, I took the opportunity to turn it into a teaching moment. TAKE RESPONSIBILITY for both your actions and the situation at large. DON’T BE AFRAID to face things head on. Like many of you, we reconnected with family and friends over the holiday season. In my case, many of these awesome people lead unique lives in places vastly different than my farm on the prairie. While I deal with deer before dawn on gravel roads dressed in blue jeans and boots, they deal with rush hour traffic while dressed in business suits. Taking the time to appreciate the diversity in others allows our own lives to take on a new depth of meaning. In doing this, we are able to shed that deer in the headlights look and actively embrace the similarities that exist in our hearts.